Berlin, April 27, 2018 – CROWDCONSULTANTS 360 GmbH, the Berlin-based management and personnel consultancy, has been named Company of the Year 2018. 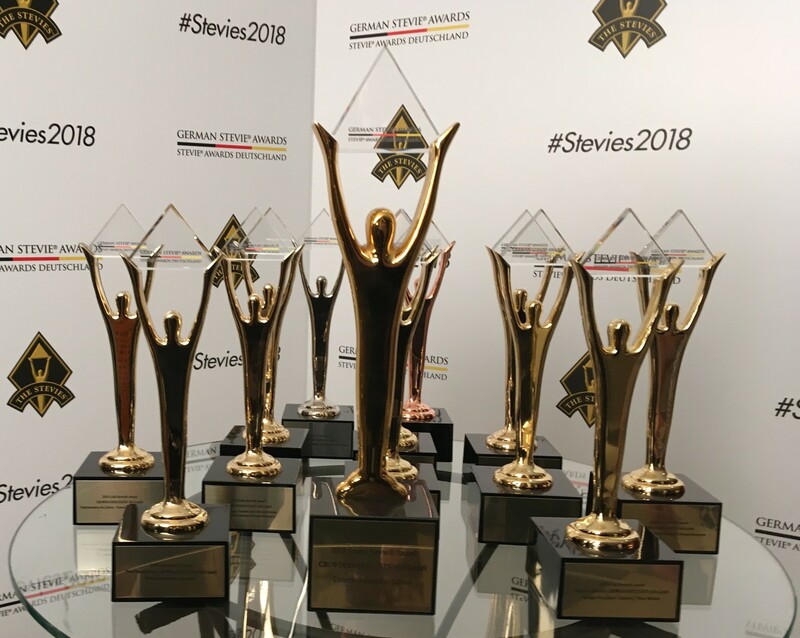 For the first time in the history of the German Stevie Awards, a total of 13 trophies went to the same company. The jury judged: eleven times gold, once silver and once bronze. The top-class business prize was awarded by Michael Gallagher, founder and president of the Stevie® Awards. 200 invited guests from the ranks of the German economy attended the award ceremony at the Hotel Adlon in Berlin. Newsreader Leslie Nachmann hosted the evening and honored achievements of companies such as AOK, Axa, Deutsche Bahn, Deutsche Telekom, Deutsche Post DHL, EnBW Energie Baden-Württemberg, Koenig & Bauer, SAP, Sixt or Voith. 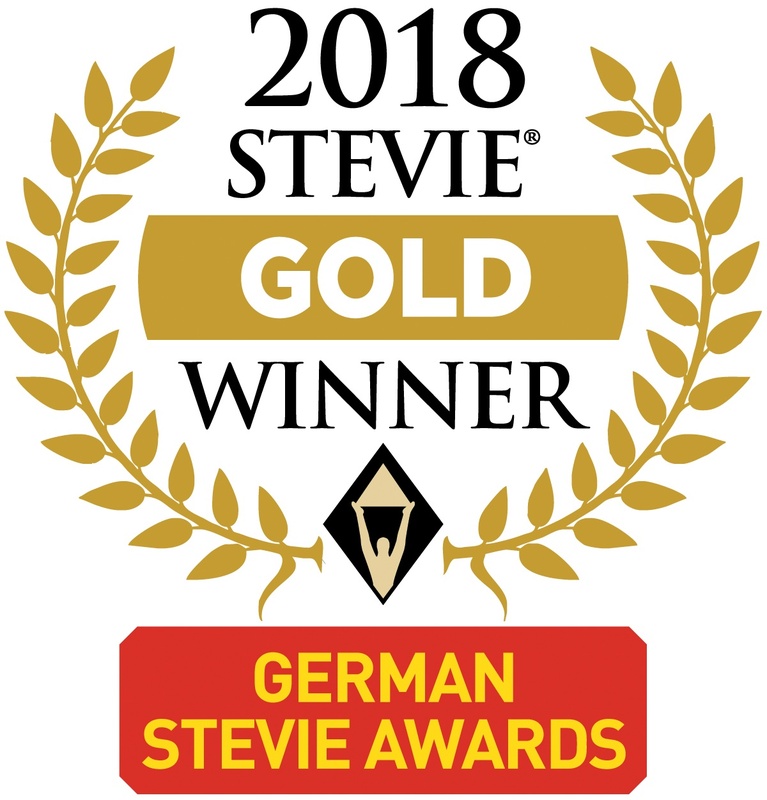 With so many trophies, CROWDCONSULTANTS also received the most important award, the Grand Stevie Award, as Company of the Year. The jury was impressed by the innovative business model: First, the project-specific recruitment via crowdsourcing in the company’s own expert network and social media. Secondly, the consciously cross-generational project teams of young digital experts and former top managers. Thirdly, consistent digitisation with a virtual infrastructure based on sharing economy principles, meaning the conscious sharing of expert knowledge, infrastructure and information via a platform. In this way, customers can be supported in recruiting, consulting and project execution more agile, sustainable and at more attractive conditions than consulting companies with traditional business models can provide. “Our flexibility and our areas of expertise are constantly increasing with the diversity and many years of experience of more and more former top managers joining our network after their successful career.” says Damiano Albrecht, co-founder and managing director. “They enjoy working with young talents and making their skills and knowledge available to start-ups or larger companies on important projects”. CROWDCONSULTANTS 360 GmbH was founded in summer 2016 in Berlin by Digital Natives Damiano Albrecht and Stefan Heidloff as well as former top executives Torsten Ecke and Peter Bachsleitner. They see themselves as a cross-generational, cross-industry and cross-functional management and personnel consultancy that consistently focuses on digitization, crowdsourcing and the principles of the sharing economy. The main focus of the work to date has been the professional support of successful start-ups such as Acrolinx or MACHTfit as well as the steering and execution support of digital transformations at companies such as BorgWarner, European Space Agency, ING-DiBa, Koenig & Bauer or Volkswagen.